Derry City skipper, Gerard Doherty produced a string of outstanding saves to ensure his hometown club a place in the 2018 EA Sports Cup decider. DERRY CITY boss, Kenny Shiels hailed the performance of his 'sensational captain' Gerard Doherty following his side's EA Sports Cup semi-final win over Sligo Rovers. Goalscoring hero, Rory Hale received the plaudits for his magnificent first half strike which saw a heavily depleted Candy Stripes progress to a first League Cup Final since their 2011 triumph. However, the City keeper pipped the midfielder to the 'man of the match' accolade as he produced a string of outstanding saves to ensure a meeting against First Division outfit, Cobh Ramblers in Sunday, September 16th showpiece. Doherty denied Mickey Drennan with an acrobatic, fingertip save on the stroke of half-time and twice denied Sligo substitute, Rafa Cretaro in the second half as the Bit O'Red pressed for an equaliser - the second an instinctive block at point blank range with two minutes remaining! And while Shiels was delighted to guide the Brandywell men into a first cup final under his watch at the third time of asking, he was extremely thankful for his captain who he believes should be the next Mayor of Derry. "Gerard Doherty should be made the mayor of Derry," said the delighted City boss. "He's a sensational captain and I'm really pleased for him because he put in a really top captain's performance. The players rallied around each other. It was such a gutsy performance and they deserve so much credit. "It means so much to me personally and the players and you can see it in their performances. Their commitment levels and energy and work ethic, which we hadn't got in the second half on Friday night was there for all to see. "I'm so pleased for the people of Derry who came up in the numbers and gave us fantastic support. It's for the city," he stressed. "We wanted to give something back to the city itself, not Derry City Football Club but the actual city of Derry. And we did it with a very understrength team," he added. Having lost two of his previous two cup semi-finals as Derry boss he was delighted to make it a case of third time lucky and hopes the showpiece can be staged at the new-look Brandywell Stadium as he gets the chance to bring the first piece of silverware to the club since 2012. "Getting a home draw would be great but who knows? We've been to Cork three or four times already this season so nothing surprises me in this game. There's a good chance (silverware) but it's about the city. I feel they deserve this as much as the players and club. 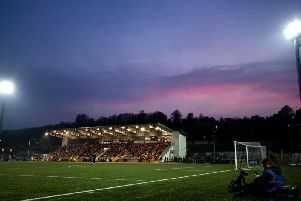 If the final is at Brandywell then that will lend itself to giving us an opportunity to give something back to the city. "I'd love to have the final to be there and that would give us a tremendous opportunity to let them see how we play - those people who don't come to matches. So hopefully we could fill it if it was at the Brandywell." Hale's 25th minute wonder strike proved decisive and Shiels agreed it was worthy of winning any match. "He put it away right into the corner. I thought it was a very good goal and we had other opportunities in the second half. So we were adventurous but knew they would gradually wear us down and get opportunities and the boys defended so well."